DeMarcus Cousins has never been to the playoffs, and this looked to be his best chance: the Pelicans currently stand sixth in the Western Conference, at 27-21, and his injury occurred in the final eight seconds of a win over the Houston Rockets, one of a handful of teams that stand even a minuscule chance in a seven-game series against the Golden State Warriors. Along with fellow All-Star starter Anthony Davis, Cousins had formed a two-headed monster in the Pelicans’ front court, and this season had been a testament to their complementary skills. They had seemed to finally figure things out and are on a four-game winning streak, and Cousins had enjoyed a historically monstrous week. Cousins had secured a triple-double on Friday night before the injury. DeMarcus Cousins has developed a dual reputation; one the one hand, he is among the most skilled centers the NBA has ever seen, capable of beating guards that switch onto him at the top of the key off the dribble and out-maneuvering fellow big men with Olajuwon-esque footwork and a subtle touch around the basket, all of it amounting to something more resembling ballet than basketball at times. On the other, he has repeatedly battled coaches and referees, an Exhibit A in the tense relationship players and refs share. As Tom Ziller pointed out for SB Nation on Saturday, in Sacramento, Cousins became the poster child of empty stats and League Pass watchability, often garnering blame for the Kings’ inability to win. The Kings never won more than 33 games with Cousins, often bumbling out of the playoff chase before Christmas. The one exception, of course, was in 2014, when Mike Malone – current coach of the Denver Nuggets and someone that had earned Cousins’ infamously fickle trust – led the team to relative stability and a 9-6 record before Cousins went down with an injury. Malone was unceremoniously fired nine games later, and the Kings reverted to futility. Pelicans head coach Alvin Gentry had seemed to be on good ground with Cousins, especially after a preseason camp in South Africa on behalf of Basketball Without Borders, a camp that Joel Embiid had previously attended. Getting along with DeMarcus Cousins as a coach is always portrayed as a fool’s errand, unless you’re John Calipari or the aforementioned Malone, but Gentry and Cousins had, at the very least, reached an understanding that did not include unwarranted fourth quarter benchings or locker room fallouts. The Pelicans were really, truly rounding into form as an anti-Warriors, anti-Rockets, beat-you-up-with-big-men team, and Cousins was as big a part of it as anybody. Plainly, Cousins doesn’t deserve this. 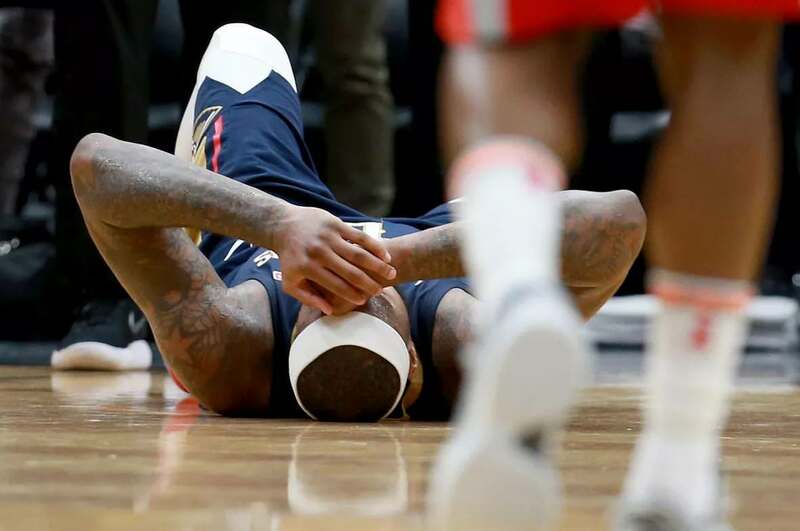 Granted, injuries in sports are inevitable and terrible and never terribly warranted anyway, and no good-faith sports fan – should those exist, anywhere – roots for a player on an opposing team to sustain an injury, let alone a season-ending and potentially career-threatening one such as what Cousins has sustained. The problem now, of course, is that Cousins is due to be an unrestricted free agent this summer. Even with the injury, teams will be clamoring for his services, though some may pause when presented with the prospect of giving a max contract to a reputedly petulant, decidedly brilliant center coming of a major injury and going into his age-28 season. If the Pelicans balk, even for a moment, the foundation of something truly incredible may be lost to the annals of NBA Twitter, a new-age Sampson/Akeem pairing that never had the chance to flourish or realize its own potential. Be mad that Cousins suffered this injury; be mad that Golden State goes right along, merrily squashing the rest of the NBA’s best and never falling victim to injury, Steph Curry’s annoying ankles aside. Anthony Davis will try his best, but the Pelicans have as glaring a bit of scar tissue in the front court now as Cousins will have after his surgery. The Rockets excepted, with their 2-1 season series victory now solidified.